The "Tokyo Arakawa Marathon" scheduled for Dec. 21 along the Arakawa River on Tokyo's northern border was cancelled without warning two days before the race after organizers failed to submit road and park use permits and other necessary preparations with either the local Edogawa Ward or national authorities responsible for the park and riverside course. Organizers had collected 5 million yen [~$42,500 USD] in entry fees from around 1500 people who paid 2000 to 4000 yen each via the popular Runnet online entry system to run in the event's 5 km, 10 km, half marathon and full marathon divisions. 70 entrants who were unaware of the cancellation began arriving at the event's staging ground in Hirai Park ahead of the scheduled 7:30 opening of race day reception. A 28-year old man claiming to be a representative of the race organizers appeared at the site by himself to explain the situation, saying, "I haven't been able to contact the other people in the organization myself so I'm as much of a bind as any of you, but we'll try to get your entry fees back to you during January." Many of the entrants raised angry voices in reply, saying, "We don't believe you." "I've been training hard and spent a lot of money to come here." "What the hell is this?" "Are you at least going to pay for our train fare here today?" The man answered, "Train fares, well....."
Despite the similarity of its name to other more well-known marathons like the Tokyo Arakawa Shimin Marathon and Tokyo Marathon, the Tokyo Arakawa Marathon is not affiliated with those or other events. On Dec. 18 an entrant contacted the Edogawa Ward office, telling them, "It's just a few days before the race but I haven't heard a single thing from the organizers." When Ward officials managed to contact the organizing group Reimei [At Dawn] on Dec. 19 they were told that the race "would be cancelled." According to Reimei staff member Takafumi Sugimoto, 30, this was the group's first time organizing a marathon. "I was surprised to hear that no use permit applications had been filed. Very sorry about that." Organizers posted a notice of the cancellation on the race website along with a request for entrants' bank account details and other personal information to process refunds. They appear to have also sent emails informing the 1500 people who had entered that the event had been cancelled and that their entry fees would be returned, but the 70 people who arrived on race morning were still unaware. One 48-year-old man from Katsushika Ward said, "I never got any email. I didn't hear anything. And I trained for this day and everything." Another said, "I came from Niigata today to run. I took time off work for it and made hotel reservations. I don't know what I should do. It's a shock." A 59-year-old man who travelled from Sakura, Chiba Prefecture was suspicious of the organizers, saying, "I wonder if they're really going to return our entry fees." Others at the site said, "It looks like they are going to pay us back, but it makes you wonder what the hell were they thinking." "I had a bad feeling about this, and look what happened." "They're asking for our personal information to process refunds? Is that safe?" According to the man claiming to be a Reimei representative, the organizers identify themselves as an NPO based in Toshima Ward but are a volunteer group without official legal status. The man said that he lives in Mino, Osaka, and that the group was formed two years ago by three marathon fan friends who knew each other and communicated online and by phone. The group's address listed on its website is actually a "virtual office" service used to provide a Tokyo-area address, a fact that has raised suspicions about its intentions. 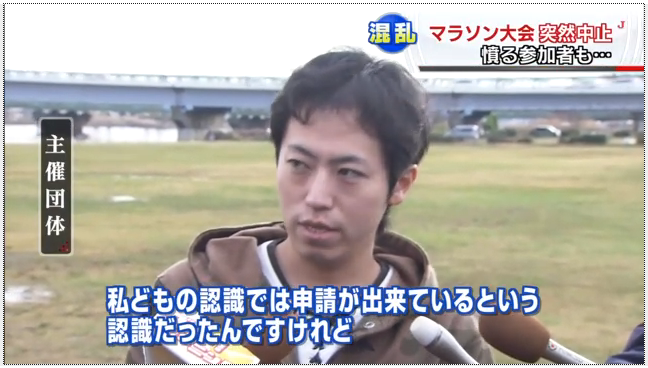 The man said that 1 million yen [~$8500 USD] of the 5 million yen [~$42,500 USD] collected in entry fees had been used to buy tents and other supplies. "Sorry for any inconvenience. We want to do our best to get your money back to you." With regard to the "Arakawa Spring Marathon" the same group is scheduled to hold in March and for which entries have been suspended, the man said, "About 150 people have already signed up, and we definitely want to fill out the necessary use applications this time so we can go ahead with that race." Well, it certainly sounds like a scam. On the other hand, if it was a scam, no one would have showed up. If it is a scam, the "organizer" has some guts to show up on race day...! Really bad, as it will damage trust people have in organizers. As a result, formalities will inevitably increase... pain in the neck. Happy I got my permission for Jan. 24 already - incidentally, on almost the same course!